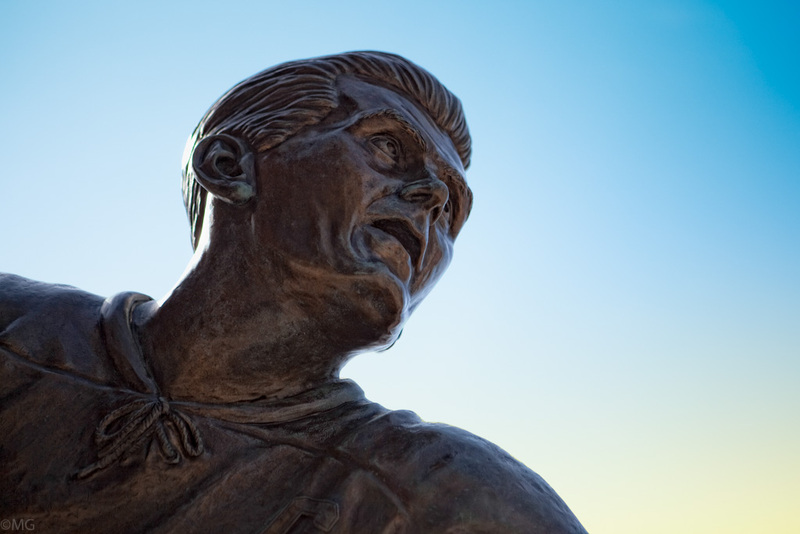 Gone form the earthly ice he may be, but Maurice Richard doesn’t lack for statues to recall him in his hey-day. 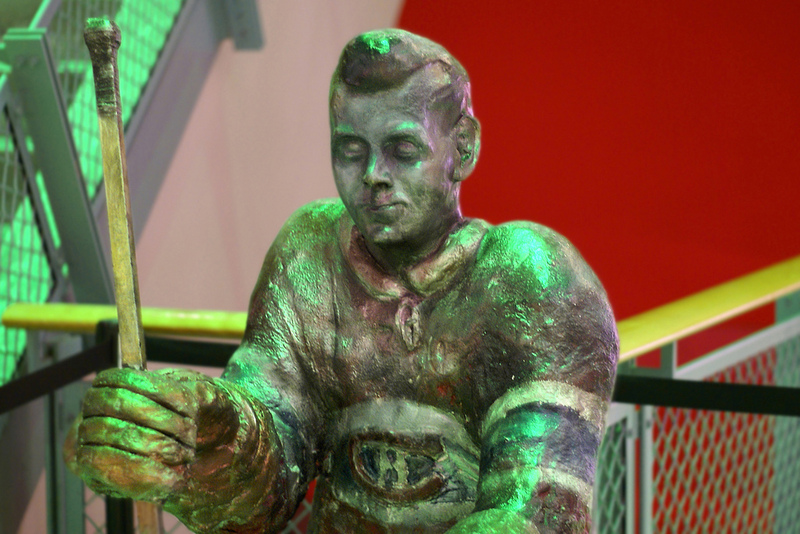 A striding Rocket glares on in bronze outside Montreal’s Centre Bell while inside the old Forum he’s stuck on the bench — looking like a quizzical Tintin? Maybe that’s just me. Another Richard leans confidently away from an unseen checker outside Montreal’s Aréna Maurice-Richard … which I guess is no coincidence. 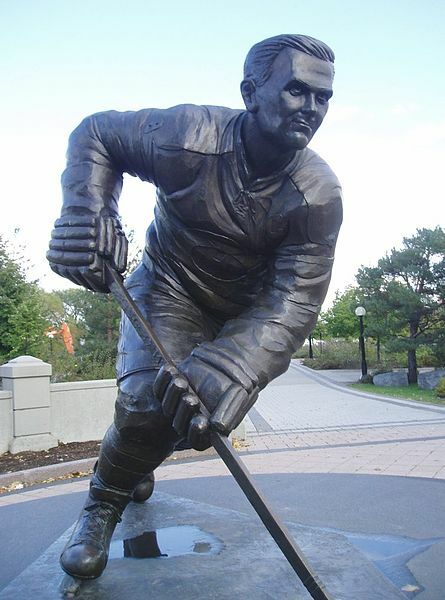 There’s one more Rocket in Hull, a federal statue honouring number 9 in Parc Jacques Cartier in Hull, Quebec. All of this by way of an update on that old waxen Richard that used to bestride a stricken Glenn Hall (see the November 29 post “Waxed”). As mentioned, Richard and Hall were sculpted in or around the 1960s by Josephine Tussaud, a descendant of the original Madame, for her Musée de Cire de Ville Marie, which once occupied a corner of Ste. Catherine West and Drummond in Montreal. When that and the rest of the city’s wax museums closed down, Quebec City’s Musée de la Civilisation acquired many of their artifacts. 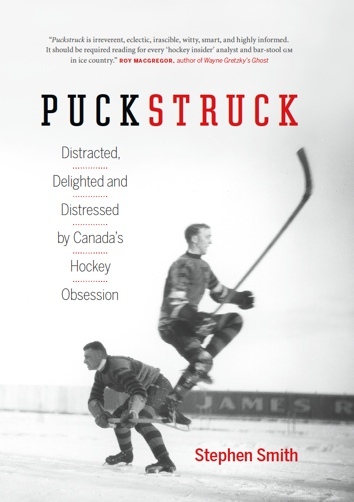 Alas, according to Serge Poulin at the Musée, the hockey players are not in the collection that survives today. Melted down, then? A terrible end that would have been, even for those awkwardest of mannequins. I prefer to think to someone had the humanity to cart them home, on the Métro, and keeps them to this day in the living room, as a year-round holy (and particularly Quebecois) crêche.